Many children place fingers, thumbs, pacifiers or blankets in their mouths to provide them with a sense of emotional comfort and security. These habits can result in irregular positioning of the teeth, and may negatively influence the development and positioning of the jaw bones, especially the upper jaw (maxilla). They can also affect the early development of speech. Long-term application of suction causes the cheeks to place inward pressure on the upper teeth, which ultimately leads to a narrowing of the palate (palatal constriction), reverse overlap of the upper and lower back teeth (posterior crossbite), and an outward flaring of the child’s upper incisor teeth (incisor protrusion). Often the lower incisors will tip toward the tongue as well (incisor retrusion). This increases the child’s overjet—the horizontal distance by which the upper incisors overlap the lowers, and increases the likelihood of the child chipping or otherwise injuring a front tooth. Because such children spend a significant amount of time with objects between their front teeth, the back ones frequently erupt farther than normal (passive eruption). When this happens, the child’s front teeth may no longer overlap vertically, a condition known as an anterior open bite. The child’s speech development may be affected in such cases, as well as their ability to chew properly. Children may also habitually position the tongue against the front teeth (tongue thrusting), rather than resting it against the palate. 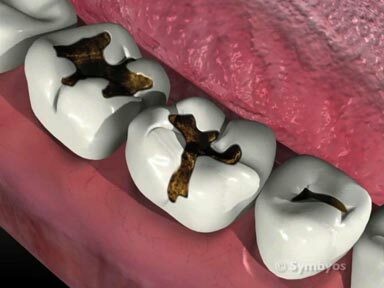 This can lead to outward flaring of the front teeth, irregular swallowing and phonetics concerns. Re-training of the tongue muscles through appropriate exercises may be needed prior to orthodontic treatment. How is the dentist establish this diagnosis? Oral habits of children are often suspected by visual examination of the teeth, and confirmed through history by interviewing the child’s parents. For example, thumb-sucking or pacifier use is often suspected if the child has forward-projecting front upper teeth and back teeth which are in crossbite (the lower teeth sit outside the uppers when closed together). Timing of intervention is critical when a child exhibits these types of behaviors. Many times a finger/thumb habit can be discouraged by placing bandages or adhesive tape on the child’s preferred digit. Use of unpleasant tasting substances can be perceived as punishment to a child, and should be avoided. If the child places blankets, pacifiers, or other objects in their mouth, eliminating the habit can often be achieved through a system of reminders and rewards, and the child should always be given an opportunity to eliminate the habit themselves before dental intervention is attempted. The reward system can be very simple—for example, a desired toy in exchange for habit avoidance. In some children, the oral habit persists despite reasonable attempts to discourage it. It may be necessary to place a habit appliance on the teeth of such children as a gentle reminder not to place fingers, thumbs, or other objects into their mouth. Such appliances should never be described to the child as punishment. Instead, the child should be told they might need a little help eliminating a habit that can harm their teeth. Examples of such appliances include the palatal crib, which is a completely passive device (does not move teeth or jaw bones), yet is an active means of discouraging the habit; and palatal expansion appliances, which actively push the upper molar teeth back toward the cheeks—generally by physically separating the two halves of the maxilla bone and not by tipping or moving the teeth themselves. Until approximately the time of puberty, the maxilla is in two pieces—a left half and a right half. The halves can easily be separated with light forces. Palatal expansion appliances also function to actively remind the child not to place fingers or other non-nutritional objects in their mouth. A palatal crib resembles a metal grate or ladder, and is attached to the upper molar teeth with metal bands. The tines are not sharp, and consequently not dangerous. They simply interfere with the child’s ability to produce suction, and physically impede the placement of objects in the front part of their palate. When the appliance is first placed, the child will often experience altered speech, some difficulty eating, and possible interrupted sleep while adapting to it. Generally these issues resolve on their own within a week or two. The major disadvantage of palatal cribs is that they make oral hygiene difficult; and can lead to tooth decay (caries) at the attachment points—as well as soft tissue inflammation and tenderness. Generally, palatal cribs are left in place for about six months. Because it physically impedes objects, the oral habit usually disappears immediately following placement of the appliance. However, it usually takes six months to eliminate the habit forever. Palatal cribs have generated some controversy among dentists. Palatal expansion appliances are of two basic types—fixed and removable. Fixed palatal expansion appliances include the W-arch, fixed rapid palate expander (RPE), and the quad helix, which is like a W-arch, but incorporates a loop of wire at the corners of the “W”. 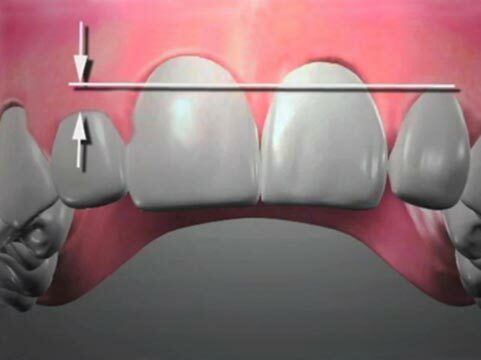 These loops allow the device to move teeth farther than a simple W-arch, and give more precise control over where the forces are directed. Simple W-arch appliances feature a springy wire bent into the basic shape of a “W”. The outer legs of the W often have a slight curve to follow the shape of the child’s dental arch. They are typically situated in the child’s mouth with the free ends and center pointing forward (toward the incisor teeth). Instead of sharp angle intersections between sections of the wire (like a conventional “W”), the corners are typically rounded to avoid soft tissue irritation. The curvature at the corners is also where the spring energy of the appliance is stored. If the child’s back teeth have moved symmetrically toward the palate from both sides, the W-arch is generally made to extend from the first permanent molar forward to the canine on both sides of the dental arch. If the teeth on one side have moved more palatally than the teeth on the other side, the W-arch may be made asymmetrical. On the side where the teeth require the greatest movement, the outer leg of the “W” will generally be kept shorter than it is on the other side. The “W” shape is compressed slightly and inserted such that the outer legs of the “W” rest on the palatal (or lingual) surfaces of the teeth. The stored energy of the compressed wire shape is what moves the teeth facially as the “W” returns to its uncompressed shape. The term “fixed” means that the appliance is cemented to the teeth with metal bands that are not designed to be removed by the patient. Normally, it takes about 3 months for a W-arch to expand the maxilla. The appliance is typically left in place for an additional 3 months minimum to retain the teeth in proper position. All types of fixed appliances produce an increased risk for tooth decay at the attachment points. Removable palatal expansion appliances can be made which require the child or the child’s parents to adjust them on an interval specified by the dentist. Although oral hygiene is much simpler, and the risk of tooth decay is reduced compared to fixed palatal expanders, removable palatal expanders require strict patient compliance to accomplish their intended task. They can also be lost easily, interrupting treatment and adding potential cost. Removable palatal expander devices are part of a broad class of functional appliances which dentists use to move, or control movement of the teeth. Removable palatal expanders feature a jack screw with a slot, into which a lever can be inserted to turn the screw. 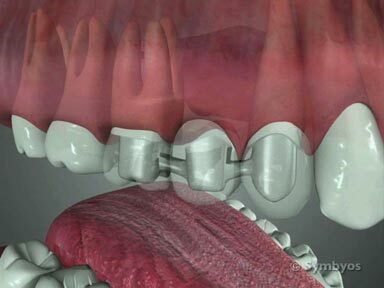 As the screw is turned, it separates the two halves of the retainer, placing an outward force on the teeth. It may be necessary to retrain the muscles of the tongue so that it will be positioned properly against the palate instead of the teeth when at rest. This can be accomplished through daily exercises, which are typically prescribed by an orofacial myologist. There may be other goals of treatment, including proper positioning of the tongue for swallowing and speaking. Speech therapy will generally involve supervision of an appropriately trained speech therapist, whose skills compliment those of an orofacial myologist. If this type of intervention is recommended, it will generally be done prior to orthodontic treatment (alignment of the teeth, jaws and facial bones). That way, a beautiful orthodontic treatment result will not be compromised by inappropriate orofacial muscle habits (for example, tongue thrusting).